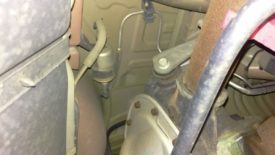 Posted 1 year ago on Tuesday, October 24th, 2017 by James S.
Before you start, you want to depressurize the fuel system. 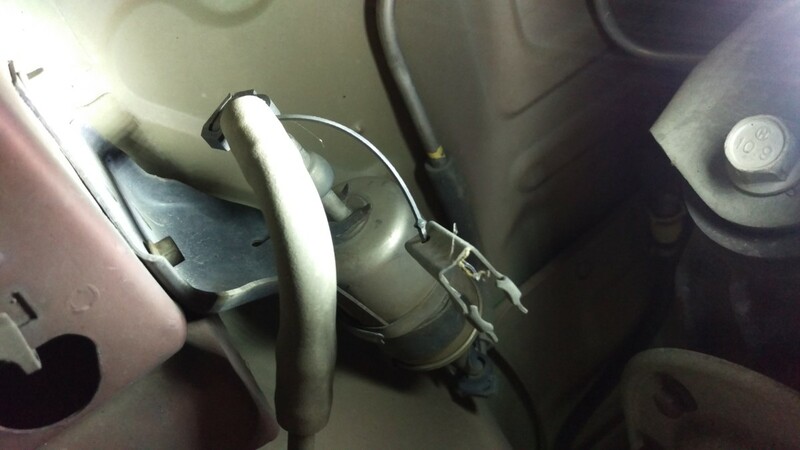 If you don’t, the pressurized gas will spray everywhere when you disconnect the fuel filter. Aside from simply being messy, this is also dangerous, as gas vapor is extremely flammable. 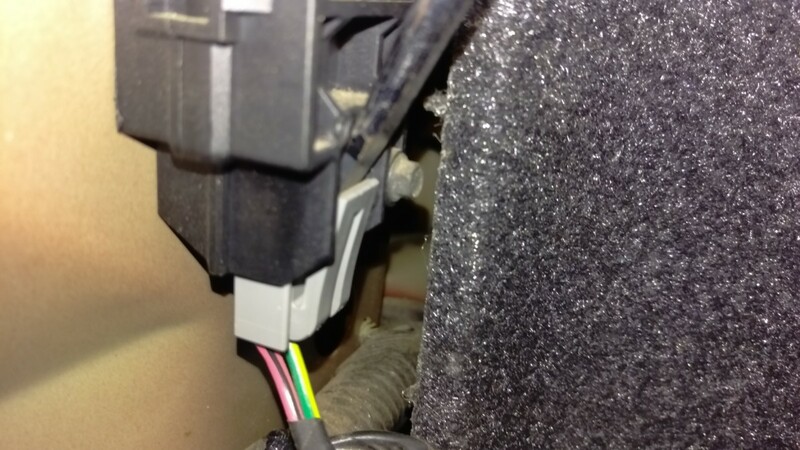 Fortunately, the Mustang has an easy way to do this via an inertia switch in the trunk, on the driver’s side. 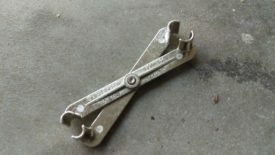 The trim is removed by undoing a plastic connector and pulling back on the cloth liner, as pictured. You can see the inertia switch at this point. It is the black plastic box to the right, with the orange on top. 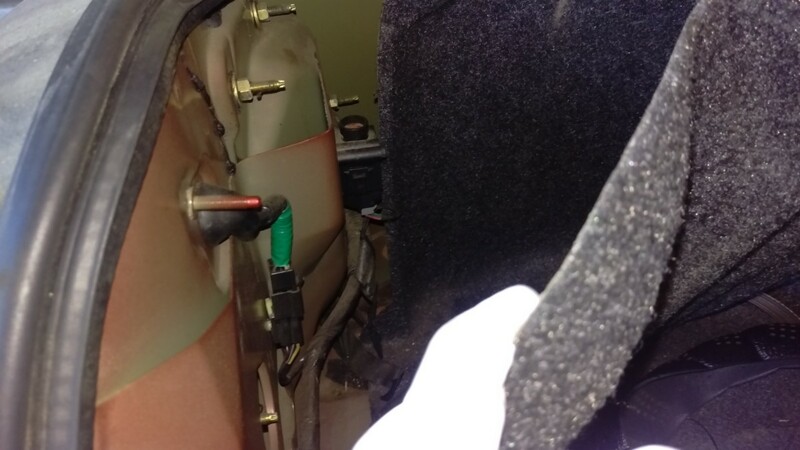 This switch is intended to shut off fuel in the event of a crash, as I understand it, but it is also the approved way to cut off the fuel pump. Now, with the car running, unplug the inertia switch connector. The car will run for a few seconds and then shut off. Voila, the fuel system is as empty as it’s going to be. 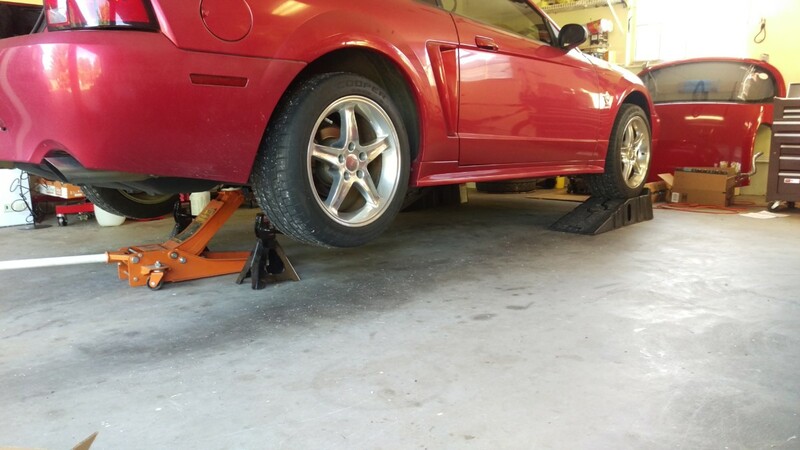 The first step is to lift the car high enough to get to the fuel filter. It’s located in front of the rear axle, above and to the front of the rear differential. You might be able to get away with only jacking up the rear of the car. To get enough space to crawl under, I ended up putting the front on Rhino Ramps as shown, and then jacking the rear of the car up and putting it on jack stands. 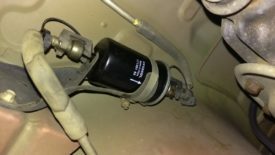 With the fuel system depressurized and the car in the air, it’s time to crawl under and remove the old fuel filter. As pictured, it’s directly above the rear differential. Here’s a closeup of the filter. 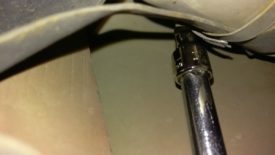 The basic steps are to remove the two plastic end covers, undo the screw securing the filter, and then remove the fuel line from both sides with the quick disconnect tool. I’ll go over the steps in more detail below. To start, these little plastic covers are secured to the ends where the fuel line connects to the filter. Simply pull them off by hand. They can simply hang there after being disconnected. 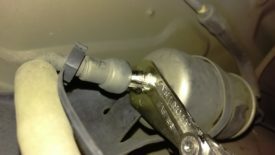 The small plastic security line will allow it to dangle from the fuel line. Once you do the same thing to the other side, as shown, you can move on. 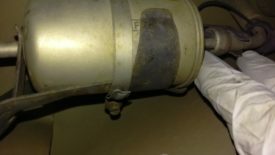 At this point, you can go ahead and loosen the hose clamp holding the filter. 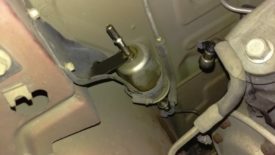 Once the fuel lines are actually disconnected, you’re going to drip gasoline and make a mess. Thus, I prefer to get this part done in advance. That way, I can yank it out as fast as possible ones the lines are off. It’s not necessary to fully remove the clamp, but that’s up to you. If you get it really loose, it’s easy enough to slide it out through the enormous gap that is left. 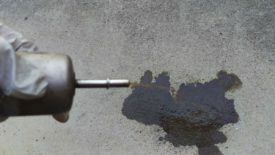 Before doing the fuel line removal, make sure you’re wearing gloves and eye protection and have a rag handy to soak up the gasoline. Even with the fuel line depressurized, you’re going to get a decent amount of gas dripping out. Gasoline vapor is extremely flammable, so make sure to not do this part with ANY open flames around, cigarettes, etc. 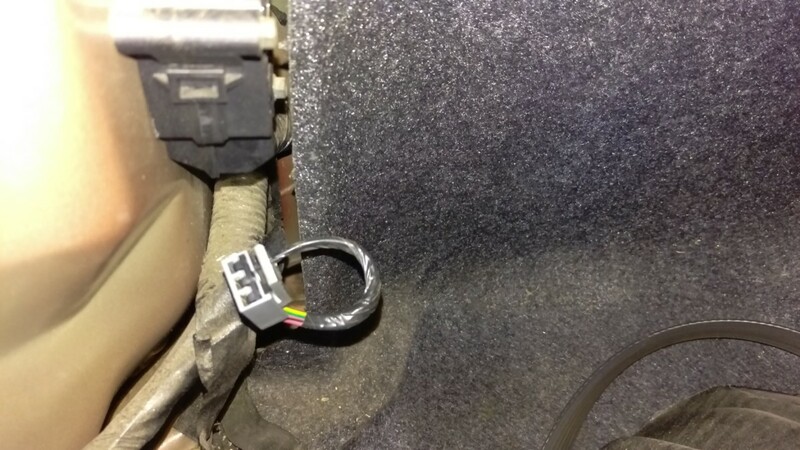 Once you’re ready, clip the tool onto the fitting and push it in away from the connector. 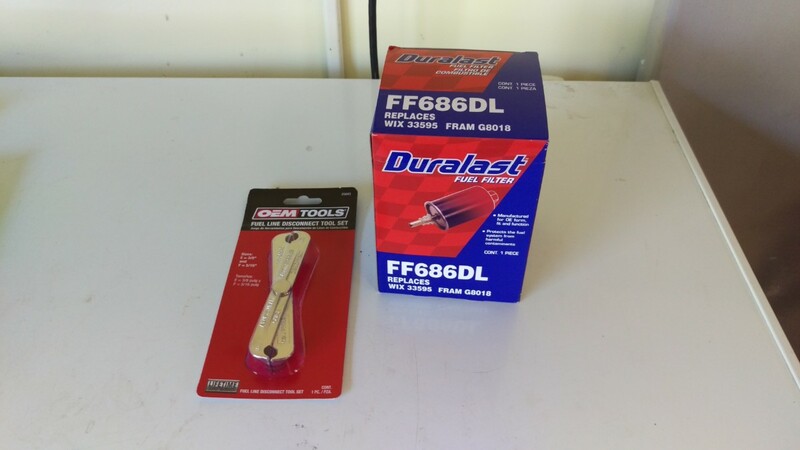 If you have the same fuel line disconnect tool I linked , you use side F. If not, it was a 5/16″ tool for my car. I have read in forums that the Mustang requires a 5/8″ tool. Your mileage may vary. In any case, you’ll know if the tool is the right size because it will close around the line. Push it into the connector firmly, which will release two clips inside. Then, pull the filter and line apart. Have a rag handy, as gas will start coming out. Both sides are removed the same way. 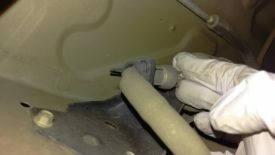 Once the fuel lines are removed, you can pull the fuel filter off of the mount and remove it from the car. 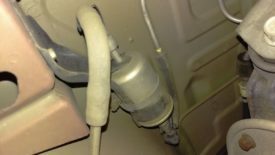 You probably want something to stick the fuel filter in after it comes out. I didn’t think ahead, and got gas all over my driveway. It came out a pretty nasty brown color as pictured; I’m pretty sure this filter was due for replacement. Reinstallation is the reverse of removal. There’s not a whole lot to it. 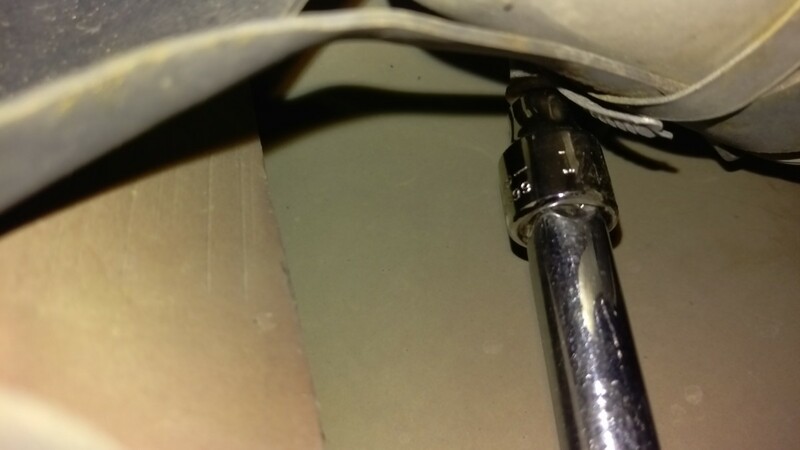 The lines push back on, the filter clips back into its mount, the hose clamp is cinched down firmly but not too tight, and the plastic clips are reinstalled. The one trick is making sure the filter is installed the correct way. The new filter, shown in the picture, has an arrow pointing in the direction of fuel flow. 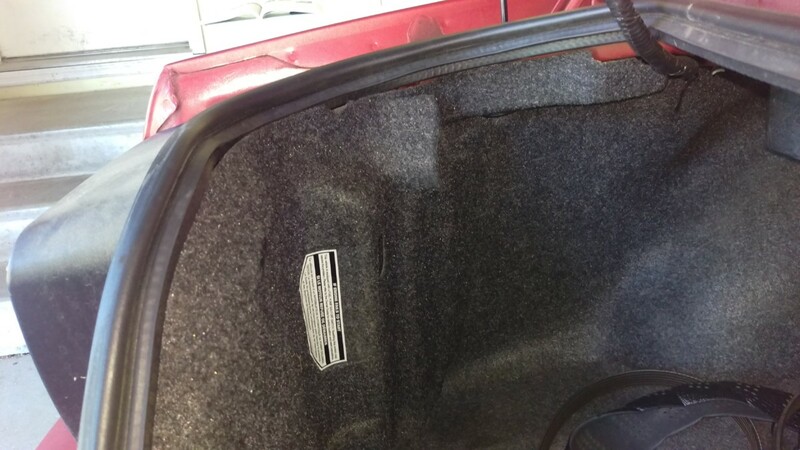 It should go from the passenger side to the driver’s side of the car, as pictured. Also, you can refer to the old filter for orientation. In all, this is an easy tuneup that can be accomplished at home with little besides a $9 tool and a cheap replacement part. 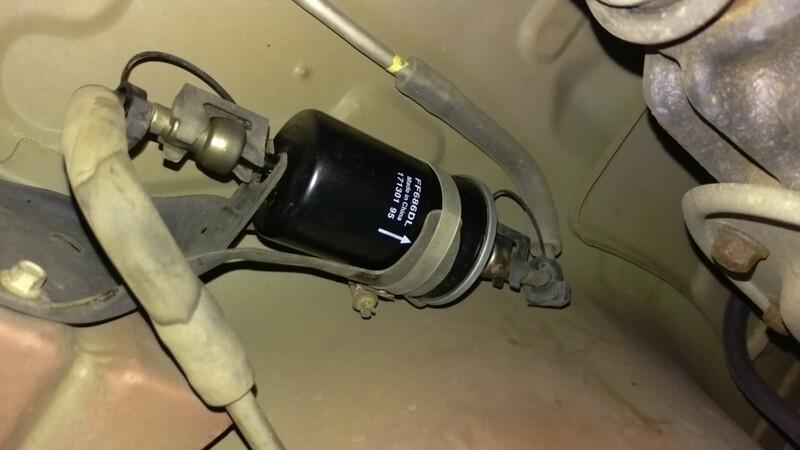 If your car is having fuel supply problems, replacing the fuel filter is a great place to start. 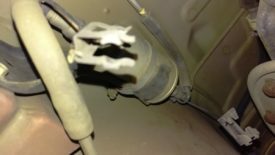 It sounds like you may have put the fuel filter in backwards? Did replacing the fuel filter solve your warm start issues? 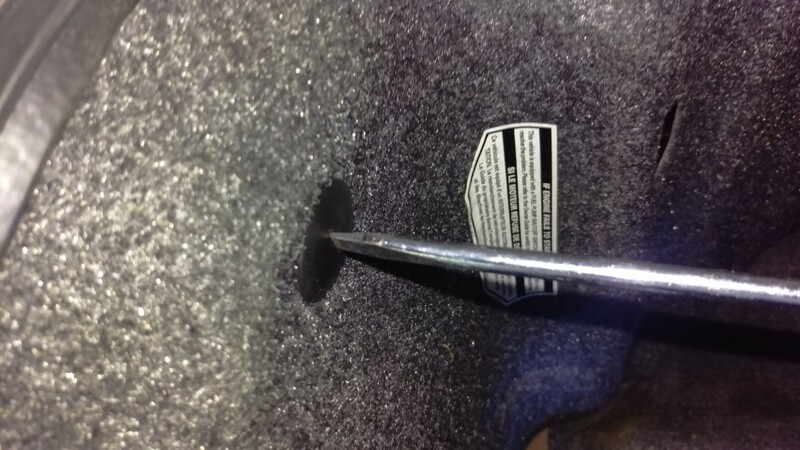 My car had that issue since it was brand new. 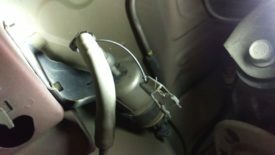 Interested in knowing if the inertia switch has anything to do with the starting issues.